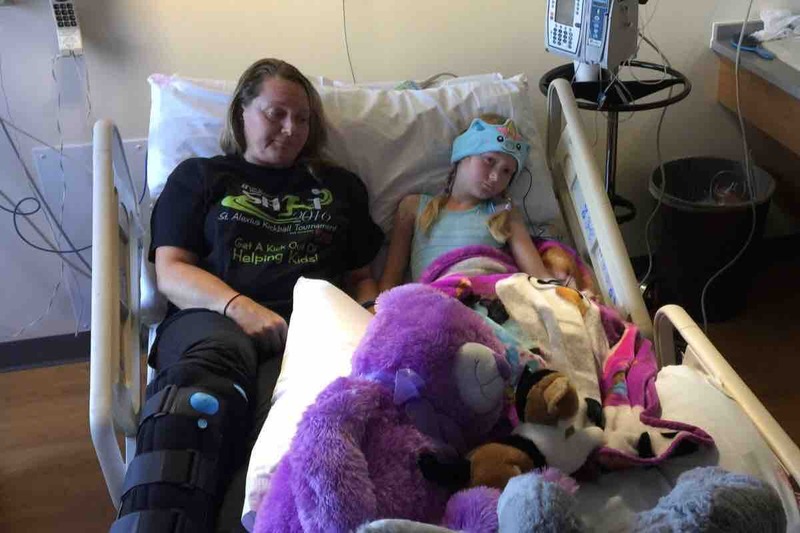 Dogs Bite Decatur Al: MANDAN ND - A 7-YEAR-OLD GIRL WAS WALKING WITH HER MOM NEAR THEIR HOME WHEN 2 PIT BULLS "SOMEHOW GOT OUT" AND BEGAN MAULING THE CHILD BREAKING HER LEG ... HER MOM WAS ALSO MAULED AS SHE TRIED TO LAY ON TOP OF HER TO SAVE HER! MANDAN ND - A 7-YEAR-OLD GIRL WAS WALKING WITH HER MOM NEAR THEIR HOME WHEN 2 PIT BULLS "SOMEHOW GOT OUT" AND BEGAN MAULING THE CHILD BREAKING HER LEG ... HER MOM WAS ALSO MAULED AS SHE TRIED TO LAY ON TOP OF HER TO SAVE HER! I am sharing this awful event so that this sweet little girl we almost lost can have every chance to heal and be afforded every opportunity for a normal life she deserves. Please feel free to share her and her moms story. On the evening of July 22, Faith and her mom Christine were taking a walk near their home to look at a special tree Faith wanted to show her mom. While on the way there,TWO PIT BULLS attacked Faith. Her mom jumped on top of her to try and save her. Thankfully individuals came to their aid to get them to safety.They were taken by ambulance to the hospital together. Faith suffered severe lacerations to her ankles legs, back and shoulder. The wounds required hundreds of stitches and over 3 hours in the emergency operating room to close up her torn body and to pin together her broken leg from the pit bull attack. This sweet little 7 year old will be required to be in a wheel chair and have to have a full leg cast for some time until she is healed. Christine suffered severe damage to her feet requiring a large number of stitches as well. She has to wear a boot on each foot and is unable to walk without assistance. Because of her severe trauma alone she will be out of work for sometime being left with other family members to help take care of her and her child. That should be the farthest thing a parent should have to worry about after going through something like this. In the months to come these two have a hard road ahead of them. Faith will need lots of physical therapy to help get this spunky little girl back to helping her dad feed cows on the farm. The lost wages for both of Faiths parents and medical expense's for these two are going to add up very quickly. Words cant even describe this awful situation in detail. Please keep little Faith, her dad Wes and her mom Christine in your hearts and prayers as family and friend's help them to move on and heal from this dog attack. UPDATE: The Mandan Police Department says the second pit bull involved in the dog attack that put two people in the hospital Sunday has been located and is in custody. ORIGINAL STORY: Two people have been taken to the hospital after a PIT BULL attack on Sunday. According to the release, the dogs escaped from their yard and attacked the two victims. Lt. Pat Haug with the Mandan Police Department says one dog was found but the other one is still out on the loose. Haug says they issued a Code Red notification to let neighbors around 2nd Street NW and 10 Ave NW in Mandan about the dog not being captured. Both victims have significant injuries to their legs and feet but injuries are non-life threatening.